Giles Muhame’s interview with CNN – where he says gays have no privacy and he hopes that the police investigates the gays and hangs them. This is very similar to arguments offered by Martin Ssempa early on when the Anti-Homosexuality Bill was offered in late 2009. In his view, gays are doing illegal things in private so there is no private consensual behavior to protect. According to the Rolling Stone editors, the paper will come out tomorrow (or Saturday according to one of them) with part two of the “hang them” campaign. Clint McCance who thankfully will resign (click the link to read his remarks) from his post as the Vice President of the Midland, AR school district said that his views were based on his Christianity. Tonight, he apologized for his remarks on Anderson Cooper’s AC 360 news hour. After the McCance interview, I saw the parents of Asher Brown interviewed who in their grief said they were praying for Clint McCance. They were devastated again by the remarks of McCance which were directed at the recent suicide victims on his Facebook page. Brown’s parents said they knew Asher believed he was gay and demonstrated unconditional love toward him. Read the news release and note the attitude of the writer toward GLBT people. How does it come across to you? It is actually offensive to me when a group suggests they are the “real Christians” so I will not engage in the same kind of rhetoric. My point is to wonder aloud what a watching world thinks about “real Christians” and if they are seeing Christ in any of us. The Midland School Board Vice-President who made remarks suggesting that gay kids should commit suicide will resign. Clint McCance told Anderson Cooper just a few minutes ago that he will resign from the school board. He also expressed sorrow for the hurt he caused the families of recent suicides. He acknowledged that he said “hateful and hurtful” things. Video is here. The Midland School District, Board of Directors, administration, faculty, and staff do not support or condone the comments Mr. Clint McCance posted on his personal social networking page. Mr. McCance was not acting as an agent of the school board, but as a private citizen when this comment was posted. This post does not reflect the thoughts of the board or administration of the Midland School District. The district strives to foster an environment that discourages all forms of bullying and an environment that encourages a safe and productive educational climate of all of our students. The district is very diligent in pursuing and addressing bullying of any variety on our campuses. The statement seems a little restrained to me but nonetheless makes it clear that McCance does not speak for his peers. No doubt there will be video on the CNN website, and I will embed it when it is available. Currently, I cannot find McCance’s Facebook page – perhaps Facebook or McCance removed it. As we reported last night, McCance wrote a series of posts on Facebook against “Spirit Day”, where people were asked to wear the color purple to support lesbian, gay, bisexual and transgender students. His rant had offensive language and many misspellings. Six people actually pressed the ‘like button on that post. But others fired back. David Bahati finally speaks. He had been contacted by several media sources asking about the AHB. 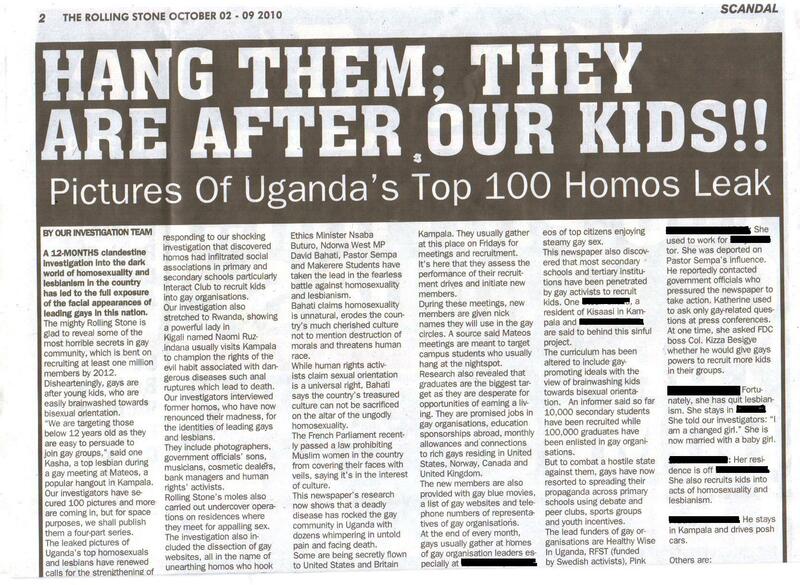 His statements come in the wake of a global outcry over a tabloid publication of Uganda’s “top 100 homosexuals” that included pictures and addresses of Ugandans perceived to be gay. It is not hard to imagine a coordination of efforts between various players and the Rolling Stone. Time is short if the bill is to move before the holiday recess. Elections are not far away either, so this might be election talk. However, with the Rolling Stone preparing an issue with more outings on Friday, a government official pledging anew to make the “hang them” campaign law is an ominous development. Barbara Bradley Hagerty wrote a segment on NPR today titled, Religious Undercurrent Ripples In Anti-Gay Bullying. Go check it out; you will recognize her interviewees and she does a nice job of covering several perspectives. Consider Justin Anderson, who graduated from Blaine High School outside Minneapolis last year. He says his teenage years were a living hell. From sixth grade on, he heard the same taunts. Anderson told his story at a public hearing last month — a hearing convened because in the past year, the district has seen a spate of student suicides. Four of those suicides have been linked to anti-gay bullying. The Minnesota Family Council and Tony Perkins of the Family Reasearch Council provide their viewpoint, and I take a different view in the segment. You also hear from Sirdeaner Walker, who lost her son, Carl to bullying last year. She is a Christian who has become a board member at GLSEN. Office of Communications & Outreach, Press Office 400 Maryland Ave., S.W. WASHINGTON – Today, the Department of Education issued guidance to support educators in combating bullying in schools by clarifying when student bullying may violate federal education anti-discrimination laws. The guidance issued today also makes clear that while current laws enforced by the department do not protect against harassment based on religion or sexual orientation, they do include protection against harassment of members of religious groups based on shared ethnic characteristics as well as gender and sexual harassment of gay, lesbian, bi-sexual, and transgender individuals. The guidance, which comes in the form of a “Dear Colleague” letter sent to schools, colleges and universities, explains educators’ legal obligations to protect students from student-on-student racial and national origin harassment, sexual and gender-based harassment, and disability harassment. The letter provides examples of harassment and illustrates how a school should respond in each case. “Bullying is a problem that shouldn’t exist. No one should ever feel harassed or unsafe in a school simply because they act or think or dress differently than others,” said U.S. Secretary of Education Arne Duncan. “To every student who feels threatened or harassed — for whatever reason — please know that you are not alone. Please know that there are people who love you. And please know that we will protect you,” Duncan continued. The guidance issued today is just one of several efforts in the Department of Education’s comprehensive approach to end bullying. In 2009, the Department joined the Departments of Defense, Justice, Health and Human Services, Agriculture, and the Interior to form the Obama Administrations Inter-Agency Task Force on Bullying. In August of this year, the Obama administration hosted the first ever National Bullying Summit and launched both the Stop Bulling Now campaign and www.bullyinginfo.org, a national database of effective anti-bullying programs. For more information about OCR and the anti-discrimination statutes that it enforces, please visit http://www2.ed.gov/about/offices/list/ocr/aboutocr.html. To review the “Dear Colleague” letter, please visit: http://www2.ed.gov/about/offices/list/ocr/letters/colleague-201010.html. An extraordinary meeting of The Rolling Stone management last nyt resolved we hit the streets this Friday irrespective of media council’s refusal to reconsider it’s decision of blocking our publication. We registered editor’s particulars on October15 but up to now they are “still consulting!! !” Our lawyers have given us a green light. Any attempts of confiscating the Stone will land someone in jail…YOU HAVE MY WORD..
Muhame Giles General…they are panicking…we have shaken their dark world…wait for this week’s issue…unveiling all the dirty secrets and faces behind a new wave of homosexuality that is spreading like wild fire…. For Uganda’s LGBT community, this is an ominous development. 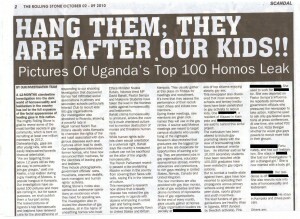 According to Frank Mugisha, people suspected of being gay were attacked after the first issue in the Hang Them campaign hit the street. This Friday, uganda’s leading investigative news paper Rolling stone will hit the streets. look out for HOMOZ part 2, latest in politics, sports, investigations,entertainment, business and much more, only in the rolling stone- LEAVING NO STONE UNTURNED. This time the scene is Hamilton, IN and the victim is Marcus Bell, 14. The tragedy happened last week. His father reported that he was being bullied, but there is uncertainty about the relationship to the suicide, according to this report from the Indianapolis Star. FISHERS, Ind. — A moment of silence was held this morning at Hamilton Southeastern High School in memory of a freshman who took his own life last week. HSE officials still aren’t releasing many details about the suicide last week of a Jamarcus “Marcus” Bell, 14, that could link the tragedy to bullying. In a news conference this afternoon, Superintendent Brian Smith cited privacy requirements for student disciplinary records and would not say whether the district had begun an investigation into the allegations of bullying before or after Bell took his own life on Wednesday. Smith also wouldn’t say whether Bell had ever reported being bullying to school officials. Bell’s father, Corey Moore, has said his son was bullied recently in welding class at Hamilton Southeastern High School. This article gives more specifics and indicates the role of bullying. Jamarcus had been bullied repeatedly at Hamilton Southeastern High in Fishers and earlier at Fishers Junior High, Moore said. Incidents included Jamarcus being hit, punched and kicked, and the theft of his shoes and some clothing, Moore said, adding that some students even kicked over and smashed candles at a vigil set up by his friends Friday night.